You need to have eye-catching trade show displays to grab the attention of potential clients and highlight what your organization has to offer before you can exhibit at a trade show, conference, expo, or other events in 2017. Your success at an event depends heavily upon the quality of your booth. As you ramp up for the trade show season, consider the following trade show displays for 2017 in Bend, Oregon. The foundation of your trade show booth is your main display. A popular option these days is simple to assemble and transport pop-up displays. They are ideal as a focal point or in the background. Plus, you might consider magnetic display systems. The graphics are Velcroed to the easy to set up frame. If you want to table at any outdoor events, you must have a portable and easy to put together tent. We provide canopy tents that are ten feet by ten feet, or roughly the size of a small booth space. Up to five people can comfortably receive shelter from the elements with these tents. And, your enterprise’s colors, fonts, and logo can be directly printed onto the canopy. 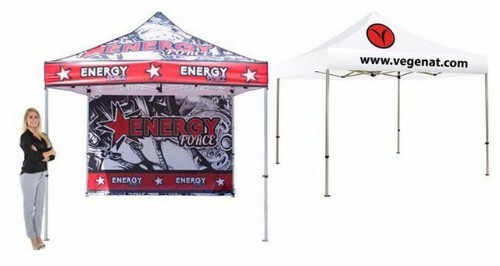 Popup tents custom printed with your branding! If you want your trade show exhibit to get the job done, you should consider retractable banners. Even if you are working an event on your own, these banners make it simple and fast for you to prepare your booth. Any graphics you want can be printed on the banner. And, after the show is done, the banner retracts into the base for easy storage. 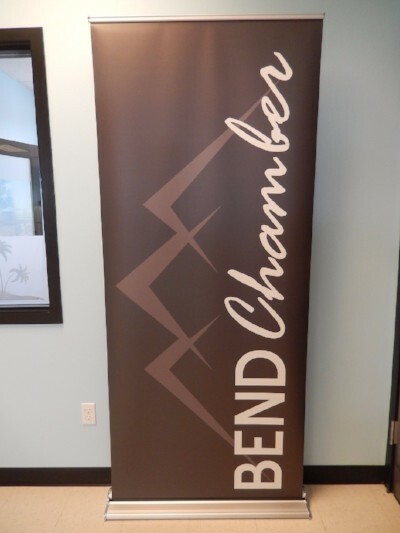 Cost-effective roll-up banners may be a better alternative when you need something less expensive. Your backdrops and table covers should complement each other. You will create an aesthetically pleasing, harmonious, and interesting look by keeping your custom prints and colors the same. 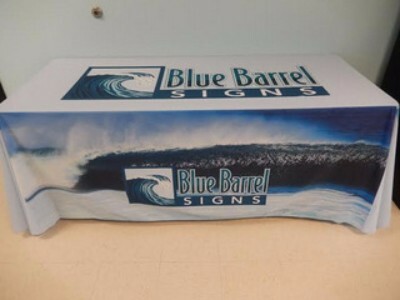 Both indoors and out, table covers are an excellent option. You can boost your brand awareness with what would have otherwise been a plain, brown table. And, you can ensure your unsightly boxes used to transport materials are out of view with table covers. Trade show table throws a must-do! Your table will probably be situated in one of the less appealing spots in the expo center if it is your first time working a convention that has been around for a while. Time to give up on getting any leads, right? Not so fast! 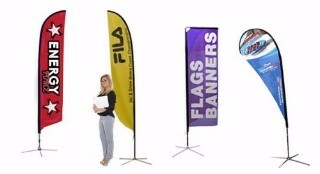 By using tall flags and hanging banners, you can attract event-goers to your booth from great distances. Feather flags and swoop banners help get you noticed! There are seemingly limitless ways for you to have a great expo experience when you employ the top trade show displays for 2017 in Bend, Oregon. For instance, you can get people talking about your booth before they even get to it by using directional arrow floor graphics near the exhibit hall entrance. Even if you are working with a tight timeline, you can contact Blue Barrel Signs for a free consultation on trade show displays. Call us today!